Not only was this my longest trail race to date, it most definitely had the longest name of any race I've ever run, too. Part of the North Face Endurance Challenge series, this particular race was run for the first time as a replacement event for a race that had originally been scheduled for the Seattle, Washington area earlier this year, but which had to be cancelled for logistical reasons related to the permit process. Well, one region's loss is another region's gain. I would be able to use this race as a final tune up and measuring stick for my upcoming first time attempt at the 100 mile distance at the Pinhoti 100 Endurance Run in Alabama in early November. Richard and I left Huntsville around 1:30 PM Friday afternoon, thinking that we would arrive in about 4 hours, just enough time to pick up our bibs and swag and listen to Dean Karnazes and other North Face sponsored athletes talk about racing. Well, because I forgot all about time zones (CST vs. EST, duh!) and because neither my Garmin GPS nor Richard's highly touted iPhone were able to direct us to the appropriate location of the host hotel, we ended up running late getting our packets. As a result, we listened to about 5 minutes of the panel discussion before heading to the hotel registration desk and to our rooms before getting dinner and heading to bed. We ended up seeing Candy Findley (from the GUTS posse) at the pre-race pasta dinner, who we had met at a couple of ultras earlier this year and who was attempting her first 50 miler this weekend. After a quick pasta and salad dinner, Richard and I headed for our room in hope of getting much needed sleep before the race. However, our "overhydrated" bodies had different ideas and I ended up sleeping about 5 hours in 45-60 minute intervalls. My alarm went off at 3:15 AM. I had my almost ceremonial cup of coffee before we headed out. We had to leave the hotel by 4 AM to head to the shuttle pick-up and drop off location, where we would ned to leave my car to catch the ride to the race start/finish area at F.D. Roosevelt State Park. After a very short ride we arrived at the trail head and race festival location. I was still pitch black outside and the only light and warmth came from the spot lights and portable heaters the event staff had placed at the race festival area around the start/finish line (blow-up North Face arch). It whole area looked like a little tent village in the shape of a horse shoe. Although I hate corny lines, here is one for you: "Excitement was in the air!" Runners were buzzing about, dropping off bags and engaging in their own personal pre-race rituals. Richard and I took the time to actually take a picture. As you can see, we didn't look too nervous about what might lay ahead of us. Our training had been less than stellar for the last 4-6 weeks due to injury and other commitments and I wasn't even sure if I could finish this thing. Richard on the other hand was quite confident that finishing wasn't even an issue. After all, the final cut off time was 14 hours. Fast forward about 90 minutes and that confidence was gone, completely gone. 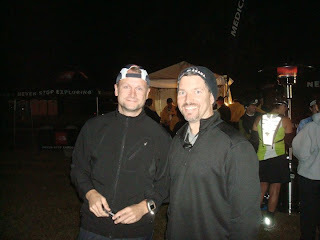 We started the race pretty close to 5AM and Richard and I lined up in the back of the pack of about 150 runners. This was definitely not a race distance were I was eager to be in the front or even middle of the pack. It would be a long day with plenty of opportunities to blow up and I figured I'd delay that as long as I could. After a very brief 150 yard run across a grassy field, traffic stopped completely as runners tried to turn into signle file to enter the single track trail. I think I spent more time waiting to enter the trail at this point than I did at any aid station during the race;-) Pretty soon after we entere the single track trail, we (or rather Richard) are officially introduced to the race. He twisted his ankle, just very lightly the first time, a little more severe a mile later, and almost race ending another mile and a half down the trail. Having hurt his ankle a few months earlier in a desert ultra, Richard continued to struggle with that particular ankle when it came to running in the dark. At this point, we still had another hour of running in total darkness ahead of us and I was pretty certain Richard would drop out of the race at the first or second aid station. I normally do not use numbered aid stations or their names as paragraph headers in my race reports, but this time, they had a purpose. Rather than break down the race and counting doen miles as we went, I opted to only use aid stations as my progress indicator, one down eight to go...you get the idea. And it worked perfectly. I jsut had to make sure to tune out Richard, who kept counting down the miles every time he heard my 310XT signal another mile split;-) The first five miles of the race up to this point were dominated by Richards ankle problems. As a result, our pace was comfortably slow, which was probably a good thing anyway. I usually have the tendency to speed up as soon as someone passes me and it was just too early in the race to do that, so Richard's injury was probably a blessing in disguise at this point...sorry Rich. 11.2 miles into the race, two down, seven to go. Again, we tried to keep a steady pace, Richard was still trying to find his rhythm, avoiding to roll his ankle for the fourth or fifth time. Instead, he twisted that tender ankle a couple more times and once daybreak hit, he slowly but surely found his stride...thank god! While the pace felt pretty slow, Richard and I ralized that we actually felt pretty good at this point, thanks in large part to the slow pace, I'm sure. But maybe, just maybe, our bodies really needed some rest and our lackluster training regimen over the last few weeks was actually a good thing. The entire length of the course was peppered with climbs between 200-300 feet at a time. Taking it easy on the pace early on would pay off later. 16.1 miles into the race and Richard and I are following our food and supplement intake schedules pretty closely. We started taking one SCap each every hour after we had been running for about two hours. I would also consume one gel every hour as well as finish one bottle of Gu electrolyte drink between each aid station. At each aid station, I would eat a piece of banana and some pretzles, nothing more nothing less. Three down, six to go. 23.1 miles into the race and my food and supplement strategy had worked perfectly. Well almost perfect, with the exception of this section of the course, which happened to be a 7 mile stretch through arguably the toughest section of the entire race course, both in distance and terrain. Not only would we climb to the highest point of this race, we also ran through a section that had been hit by a recent fire. This part of the course looked more like a trail I would expect to see running in Arizona, very desert like in certain areas, but in a very pretty kind of way. Not sure if that makes sense, but that's what it looked like to me. My only concern was the fact that I ran out of liquids with about 3 miles still to go to Rocky Point. It wasn't really that I needed the liquids, it just felt wrong not to have any readily available to drink. While I was still feeling pretty good during this section, Richard had hit a major wall at this stage, both physically and mentally. He later said that he was ready to drop out of the race at this aid station, if it hadn't been for the magic of Coca-Cola. He drank about three cups of Coke in addition to other liquids and shortly after we left this aid station, he was a new man...or should I say runner? Four down, five to go. 28 miles in and Richard was still leading our small group of runners. Miguel Perez, a first time ultra runner, had joined our little group at around mile ten and he was sticking with us and looking strong. We were finally past the half way point of the race and while I experienced a short phase of sluggishness during this section, I was feeling pretty good considering that we had already covered close to a marathon at this point. This section of the course also covered a ton of creeks and small waterfalls and while running these sections was nearly impossible at times, it certainly made up for it in beauty. Richard was still feeling it and he continued to lead us out of this aid station as well. We had gotten into a pretty good rhythm concerning getting in and out of the aid stations quickly. I don't think we ever spent more than 1-2 minutes tops at each stop. Five down, four to go. Mentally, the counting of aid stations really worked for me. 32.2 miles down and more than a 50K done. Half way between this and the previous aid stations, I took over to lead the group around mile marker 30. Richard had left the group for the last 10 miles and while providing some assistance to a runner on the side of the trail, I continued at a walking pace to let Richard rejoin our group as soon as he made sure that we could leave the runner. We decided to notify the next aid station of the runner in distress but didn't have to as emergency crew was already making its way to the runner before we reached the next station. Thankfully, the runner is question turned out to be ok. While she did not appear to have been able to finish the race, we saw her later on in the race festival area walking around on her own. Once Richard caught up to us, I started to run again. I was feeling good, probably catching a second wind myself at this point. Before I realized it, we had reached Dowdell Knob, six down, three to go. 37.5 miles are in the books and I am still feeling great. Once we reached this aid station, all I wanted to do it wash the sticky Gu past off my hands as well as clean the salt residue off my sweaty face. After identifying cups of Gu electrolytes and Coke I went for a couple of cups I assumeed to be water, proceeding to pour it over my hands and face to clean off the sticky mess. While doing so I noticed a nice refreshing scent coming off the water. That just didn't make sense, why would the water smell like fruit? I got my explanation when I asked for confirmation. The clear liquid I assumed to be water was in fact Nuun, another electrolyte drink that did not use any food coloring for this particular drink and as a result looked like water. Hey, at least I didn't eat any lube thinking that it was engery gel. When I finally got my hands on some "real" water, I was able to wash all of that mess of my hands and face. Seven down and just two to go. 42.4 miles are complete and I am confident that I am going to finish the race. Even if I walked the remainder of the race, I would still finish with time to spare. Instead of walking, however, I decided at around mile 40 that I was going to push the pace a little bit, at least as much as I could at that point. Richard and Miguel started to fade just ever so slightly and I felt I could try and push for a sub 12 hour finish, which was all I had hoped for at the half way point of the race, anyway. I just couldn't believe that I actually felt good 40 miles into a trail race. My goal was to maintain pace and to pick it up on the downhills whenever I could. The volunteers at this aid station were once again first class. They helped me refocus, replenish and get ready for the final stretch. Eight down, final aid station to go. 47.8 miles are logged and I can smell the BBQ at the finish line. Well, not really, but I was looking forward to that hot meal promised in the participants' guide. During the section preceeding this aid station, I really cranked it up a notch. I must have passed between 10-15 runners during this section, some of them marathoners using the same course, some of them 50 milers. Either way, I was passing runners and it felt good...nope, it felt great. Instead of running out of gas, I was running the uphills, even if just slowly. I was running nonetheless. Every runner I passed gave me new energy. Nine aid stations down, just the finish line ahead. This race provided an elevation change of around 8000 feet, which isn't too shabby. The final 2.6 miles felt the hardest, just because they seemed to take forever. Physically, I felt fine and mentally, I was exstatic. After 12 hours and 9 minutes, I crossed the finish line, happy to have completed an awesome ultra and physically feeling good. The icing on the cake for me personally was the fact that I finished 43rd out of 125 or so starters. I am competitive, after all.